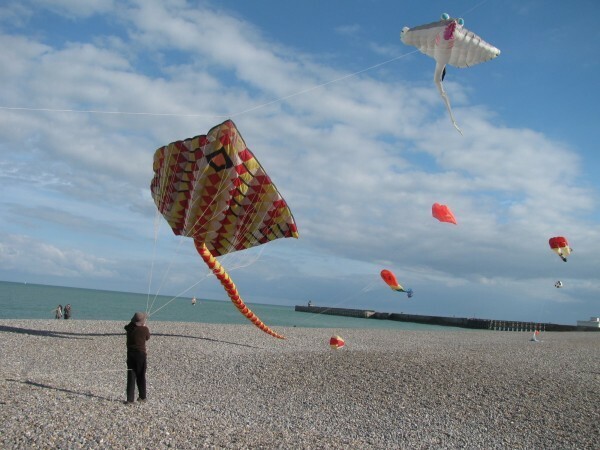 From september, 17th until 19th, Volker attended the International Kitefestival in Dieppe, France. The first people to meet at the flying field (beachside) were team AWITA. Their big kites were easy recognisable in the early morning on saturday. Always in the air... For sure more kgm*hrs than team NZ. During the day I tried a small SFT, produced and brought by Matt of PLK. After some changes of the through cords, I became quite happy with the performanance. During the nightflight, the wind dropped a bit, stopped for a moment and moved on. Although I am a native north german and used to refreshing temperatures, I considered the ambient temperature as "chilly". I don't want to imagin how the friends from Italy or even Indonesia, Malaysia or Thailand felt. Sunday was a sunny day, too. 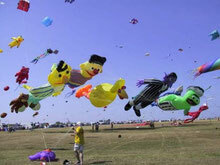 Again a wonderful range of wonderful kites in the sky. 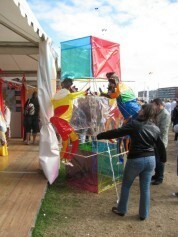 The wind was sideshore, and e.g. Peter Lynn used the stable breeze to launch below his latest RAY design the grandfather of the inflatable RAYs. Somehow he managed to get his first RAY, made in 1988? to Dieppe. It looked a bit scary, nearly like prehistoric. Some people consider me as being colour blind, but that first ray... don't know what to say... taste is not discussable... Anyhow, it was great to see soo different stages of the evolution of this kite soo close to each other. I had to leave at 16:30 to be not too late at home. 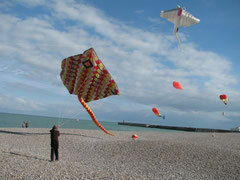 But next year, I will spent more time at the kitefestival in Dieppe. It was a great experience to be there for the first time.